My Favorite Gifts – Randy | Faddegon's Nursery, Inc.
Our nursery stock manager, Randy, is a very busy guy all year long, but we couldn’t imagine not finding out what some of his favorite gifts are. He stopped for a moment to share his thoughts and we’re so glad he did! Many of you know Kerry Mendez and her total love of everything garden. Her latest book, The Right-Size Flower Garden, led her to create this 2016 calendar. Filled with gorgeous garden photographs, great garden tips, and inspiration, this calendar is just right to see me through the next year! The Aztecs called them cuetlaxochitl. In Mexico, they are known as ‘Flores de Noche Buena’, or ‘Flowers of the Holy Night’. Botanists call them ‘Euphorbia pulcherrima’ which translates as ‘the most beautiful Euphorbia’. By any name, the poinsettia has never let go of its place as the Christmas plant. Furthering their fame, Joel Poinsett, Ambassador to Mexico from the U.S. in 1825, brought the poinsettia to America. It didn’t take long for these beautiful plants to catch on as ‘poinsettias’. Enhancing their popularity was the fact that they flowered so profusely during the holiday season. 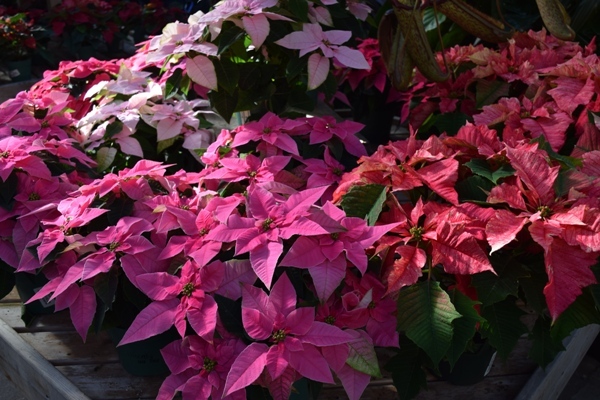 Hybridizers have made huge leaps in working with the poinsettia. Along with classic holiday red, these reigning Christmas plants come in white, ivory, a range of pinks from soft to hot, and loads of mottled and bi-color varieties. Dressed up or paired with evergreen boughs, they deliver holiday charm like nothing else! One of the most common questions concerning the poinsettia, is how to maintain them over the year so they re-bloom the next year. This is quite a project, and if you’re so inclined, see our page on poinsettia care. I love a Fraser fir Christmas tree. Goodness knows, I’ve seen enough of them to know a good tree. I like the way the branches tend to grow slightly upward, allowing me to put on ornaments without having them end up on the floor! The needle retention is very good, the naturally full and pyramidal shape is pleasing and the color is nice and dark. Of course, the best characteristic is the scent. Ahhh. There’s really nothing better! As with the poinsettia, the holly plant is another quintessential holiday favorite. Decorating with the small red berries bordered by three dark green leaves began as a tradition in the 17th century when Englishmen used them to deck their homes and churches during their Christian celebrations. I like to create a unique and festive centerpiece by submerging holly clippings in a large vase and top with floating candles. Sprinkle in cranberries for a bigger pop of color. If you prefer simple over extravagant I take holly sprigs and stick them in the corners of mirrors or in my window panes. Don’t mistake these gems for mistletoe! Though visually similar, holly is in a different genus than mistletoe. Mistletoe is a semi-parasitic plant whereas holly is safe to be planted among your other flora.